Irish people spent a total of €1.34 billion in December on internet shopping. IRISH CONSUMERS ARE using their debit cards on a more frequent basis with €3.6 billion spent in December last year – up 15% on 2016′s figures. 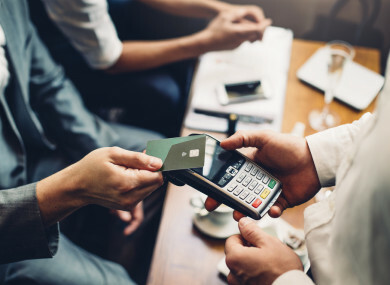 Information released by the Central Bank revealed that debit card transactions accounted for 57% of new transactions on all cards in December. Retail and services debit card expenditure all recorded double digit increases over the year to December 2017.
Credit card spending was largely similar to the same period in 2016, experiencing a minor increase of €19 million. Irish people spent a total of €1.34 billion in December on internet shopping, with €949 million and €389 million attributable to debit cards and credit cards. The December value is 15% than the previous year. E-commerce accounted for 21% of new transactions on all cards during the month. It now forms 26% of debit card spending and 40% of credit card purchases. AIB reported a 6% increase in turnover in card sales for the sector for 2017. The bank released its 2018 Pubs Outlook, which also finds a 6% increase in spending by UK visitors to Irish pubs in the 12 months to the end of October 2017, despite a decline in visitor numbers from the UK. Food was a key driver of growth for the period, with food service in pubs reaching a market size of €982m in 2017, up 3% year on year. Irish publicans are accepting card payments in growing numbers, with some city centre pubs now achieving 80% of their turnover from credit and debit cards according to Visa. Read: Which county in Ireland has the most pubs per person? Email “Irish people spent over €1.3 billion on internet shopping last year - most of us used our debit cards”. Feedback on “Irish people spent over €1.3 billion on internet shopping last year - most of us used our debit cards”.